Alleys all over the world are sources of inspiration for Toronto laneway projects. Traveling offers an opportunity to see what other communities have created with their back-lane spaces, with new uses always popping up. 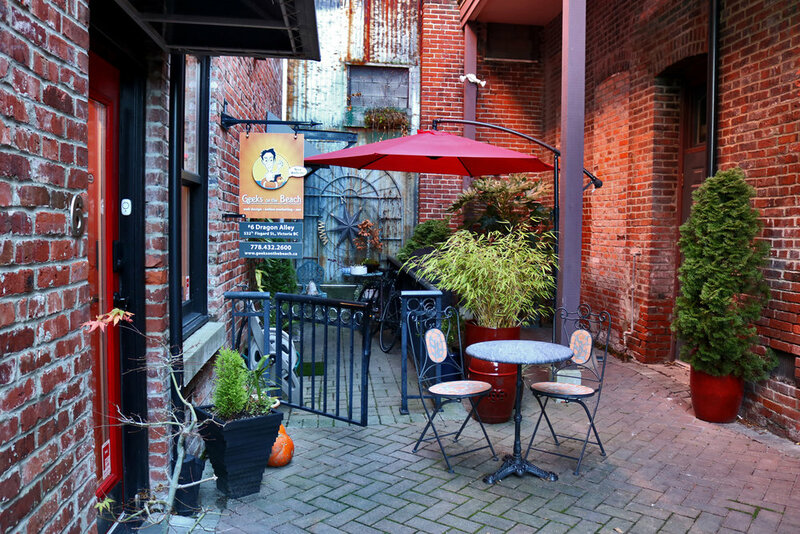 In Victoria, one of the oldest cities in the Pacific Northwest, commercial alleyways have been a part of the city’s fabric for over a hundred and fifty years. Instead of focusing on ways to revitalize their downtown lanes, Victorians are exploring how they can preserve their city’s history while continuing to use these narrow commercial spaces efficiently in the twenty-first century. Did you know that Victoria is home to Canada’s oldest Chinatown, first settled in 1858? The port city was the first stop for many Chinese immigrants hoping to build new lives in the new world. Our favourite start to exploring this colourful and delicious neighbourhood is by finding your way through Fan Tan Alley—which holds the title of North America’s narrowest street at just 90 centimetres. 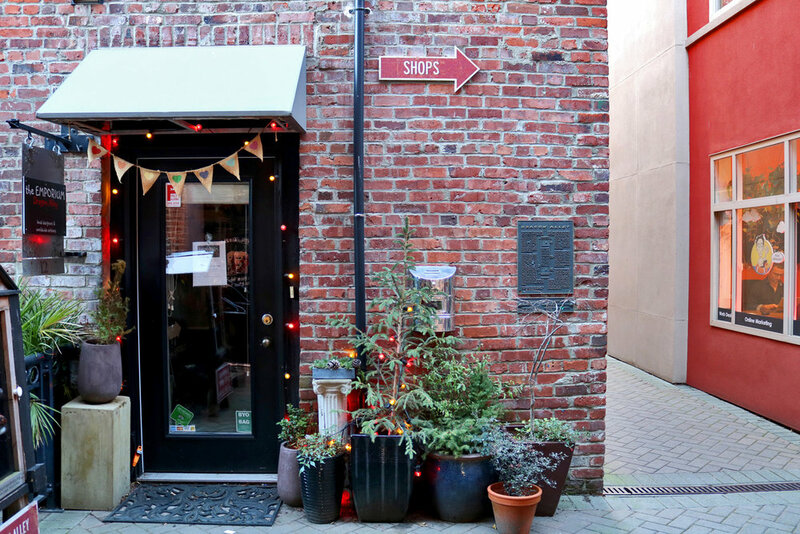 Located between Fisgard and Pandora in downtown Victoria, Fan Tan Alley is packed to the brim with local eateries, old stories and cute shops. Once notorious for illicit activity and secret escape routes, the lane gets its name from Fan Tan, a Chinese gambling game of pure chance that was often played behind closed doors. Betting and opium dens lined the area’s back ways, with peepholes installed to help monitor for police raids. Crackdowns by authorities forced Fan Tan Alley into disrepair by the 1960s, with residents abandoning the street due to condemned buildings and unsafe activity. Fast forward to 1998, when the zone was declared a national historic site thanks to the city’s successful reduced rent program, an idea pushed by Dr. David Chuenyan Lai to encourage artists and businesses to revamp the space on their own terms. Over time, boarded up windows and dilapidated buildings were revitalized and transformed into art galleries and shops. A space once filled with opium smoke and broken glass is now a red lantern-lined lane complete with vegan ice cream, locally-made jewelry, fancy soaps and a plaque to remember the olden days. 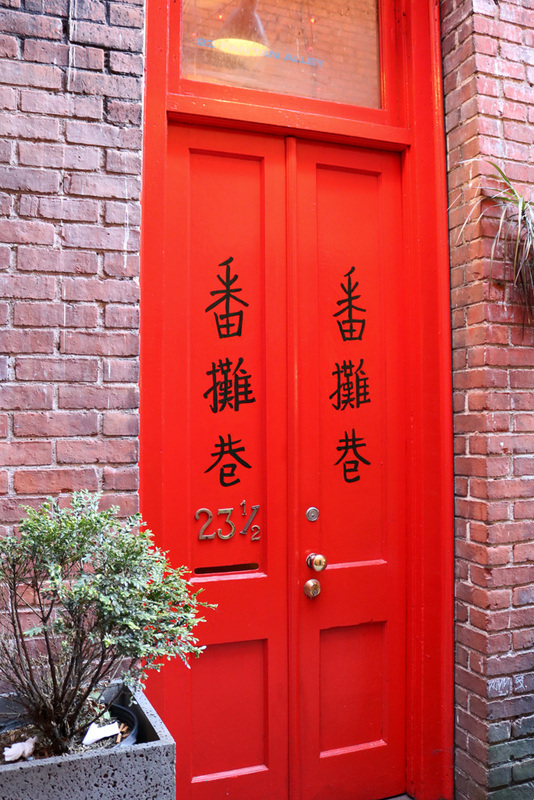 Hidden courtyards and zen gardens await urban explorers in Victoria’s Dragon Alley—a narrow lane between Harold and Fisgard just north of Fan Tan Alley. Home to a plethora of small businesses, Dragon Alley brings its own charm to Victoria’s Chinatown with water features, a Little Free Library, and fun community events like this past August’s “Summer in the Alley” fundraiser. Recently-added colourful string lights lure visitors from the street down the narrowest section of the lane, which opens up to a larger bricked area filled with unique live/work studios, small offices and patio seating. In its early days, Dragon Alley was the site of wooden huts for new Chinese-Canadians, stables with horses for rent, a second-floor brothel and more. According to a historical plaque, the area’s “maze like planning is similar to the layout of Chinese cities in that behind the façade of commercial store fronts exists a labyrinth of narrow alleys, interior courts, and internal passageways, creating a unique neighbourhood secluded from public view.” Revamped and reopened in December of 2000, the lane now holds a special place in the heart of Canada’s oldest Chinatown. 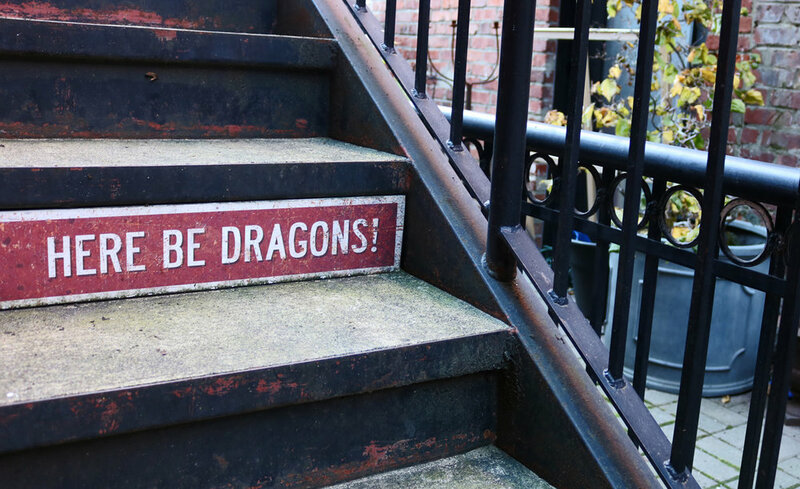 Official Dragon Alley-branded candles and merchandise can be purchased at The Emporium Dragon Alley, an artist-run shop in the south end of the historic laneway. A common shortcut between Yates and Johnson, Waddington Alley in Victoria’s downtown lies just south of its famed Chinatown neighbourhood. Named after Alfred Waddington, who built the lane in 1858 to join three private properties at the height of the Fraser River gold rush, the area was dubbed “Victoria’s original shopping mall,” and was home to a slew of alley businesses including a soda water factory, stables, bakeries, a blacksmith, restaurants, fishmongers, a cobbler, gambling houses, a dancehall and even a bowling alley. The laneway was already in need of restoration when it became city property in 1872. Today’s Waddington Alley is lined with century-old buildings and features interesting blasts from Canada’s past, including rare metal curbs designed to keep pedestrians safe and separate from carriageways. But the most interesting feature—and one that can be easily missed—lies beneath visitors’ feet. The alley is paved with wooden blocks made of old growth Douglas Fir trees, as was customary at the turn of the century. To preserve the wood and increase friction during winter months, the original fir planks were treated with creosote, a toxic coal-tar preservative. The alley’s unique paving was almost lost in the 1980s, when the city ripped up many old streets and replaced them with more versatile paving options. We can thank Victoria counselor Geoff Young for his foresight in halting this historic alley’s destruction one day when he just happened to be passing by. Restoration has not been easy. With old-growth Douglas Firs no longer readily available, the city had to source timber for replacement planks from the bottom of nearby Lake Cowichan. After some trial and error, an effective creosote alternative was devised, and the alley is now as beautiful as ever. Visitors should make a point to take a closer look and count the tree rings on each road paver. While alleyway businesses and laneway courtyards may sound like a fresh idea to Torontonians, we can learn a lot from studying past uses of these narrow spaces. Taking cues from old world-inspired city planning, citizens can work together with the city to preserve compact historical areas, like parts of the Distillery District and Kensington Market, and also ensure creative use of public space is part of new developments and master-planned neighbourhoods.